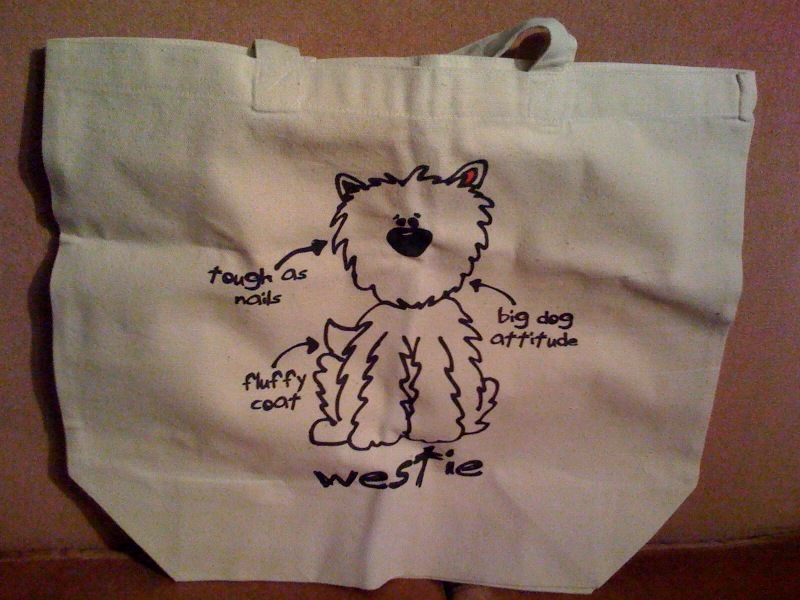 Cute Westie Cotton Tote Bag - AUCTION ITEM - bidding to start at $8.00 - shipping worldwide!! How could any human resist this cute cotton tote bag with a funny carton picture of a Westie on the front?! We're sure this will appeal to all Westie owners out there - and if your human does order this just think of all the yummy noms and stuffies it'll hold for you!! Don't delay - place your bid today! Okay, mom said I could bid on one item and I did but now there is this!! I have to have it for my cousins. They are Westie-Maltese pups! I bid $8. Mom won't mind. It's for Shelby!!! We bid $20 for this cute tote!! !